Grown on the outer Cape in Orleans, Pleasant Bay Oysters are a clean, briny oyster that taste just like the ocean. With a salinity level almost as high as ocean water, you'll be sure to get a dose of the Atlantic. These oysters consistently have beautiful, deep cups, and great meat fills. Pleasant Bay Oysters are always a solid choice, and we are proud to be distributing the best oysters from Little Pleasant Bay. Flavor: Extremely uniform in shape - deep cupped. Moderate salt content with clean, prolonged ocean finish. Oyster seed is floated in fine mesh bags and moved to larger mesh bags as they grow. Time to market: 2 to 3 years. Peter Orcutt and his family have been growing oysters since 1987. 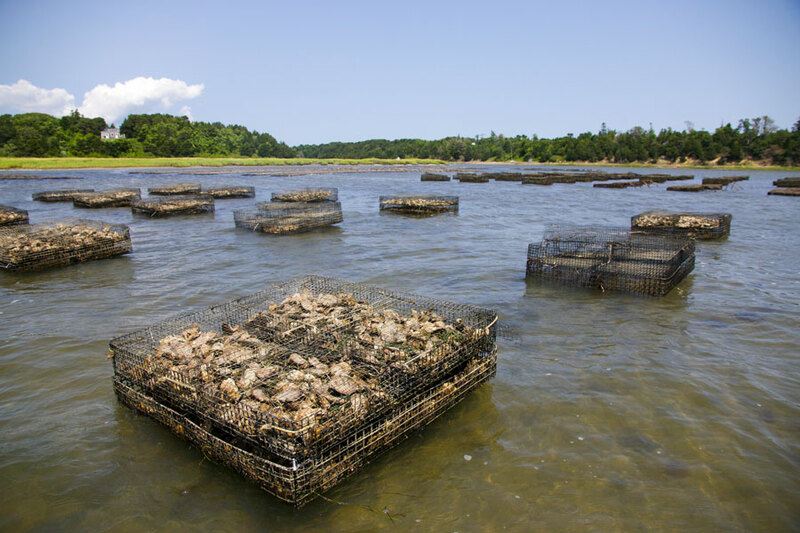 It took Peter four years and a move from Chatham to Orleans to get his oyster farm started. He first started growing quahogs and eventually moved to oysters. Unfortunately, aquaculture was still fairly new, and Peter recalls that it took years of "research and development" (trial and error) to get the methods right. Today, the Orcutt family have the oldest standing oyster farm in Little Pleasant Bay, so if you're looking for the best Pleasant Bay Oyster, look no further.